This is great Chris, thank you! We literally began some projects this week where have an issue with a simple CSV file import; a libref that is assigned (verified libref properties are readOnly:no, Temporary:no) using the servers menu does not get recognized by the ImportData until after a base sas program is executed containing the libname does the ImportData produce a SAS datatset on the server directory assigned. What am I missing here? Is there a option or config setting that I've overlooked? Does right clicking the library not assign the libname ? Or worse, am I expecting too much auto-magic? If this is a metadata library, you probably want to make sure that "Pre-assigned" is checked ON within the definition. That ensures that the library will show as Assigned when you connect to the server. See more in this documentation topic. Excellent under the hood article and immediately useful for me. Yes, I often like to do a task in SAS Enterprise Guide first, then generalize to a SAS program often in fact in a SAS macro program loop. 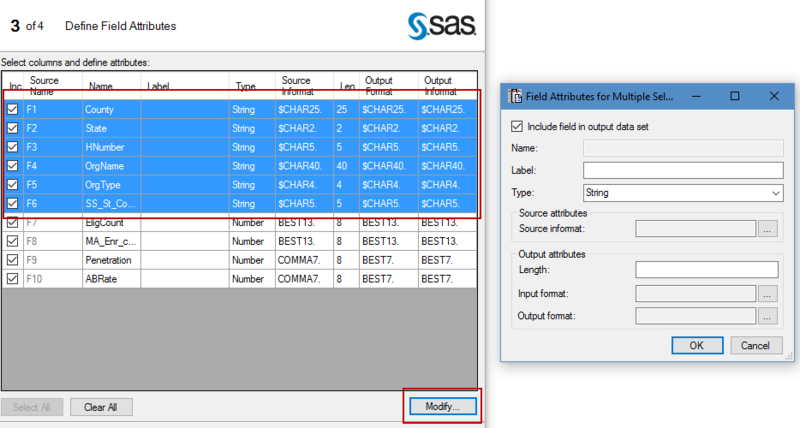 So often, I must import a data file at some point in my SAS program, so I make the import code in SAS Enterprise Guide. I am writing a SAS Global Forum paper about this type of step in SAS using SAS 9.2, 9.3, and 9.4 and going from 32 bit to 64 bit then mixing in Microsoft Office versions and Microsoft Windows versions. I had not thought of the changes in versions of SAS Enterprise Guide. 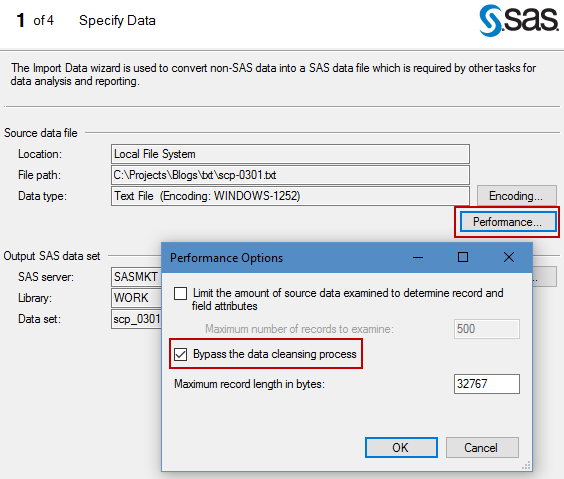 Is the step with the "Generalize import step to run outside of SAS Enterprise Guide." check box, only in some more recent versions of SAS Enterprise Guide? Peter, these features for the Import Data task have been in the application for several releases. I have a question about SAS EG. Is there any way to redirect the log of SAS to a file when executing a SAS EG project? 2) Can you send a parameter or macrovariable of a SAS project to the LASR server of SAS VA? Juan, You can use the Project Log feature in EG, and Export As a Step at the end of your flow. That should get you what you need as the record of a project run. Regarding parameters -- the only way to share a prompt value from one project to another would be to save the value from Project 1 (using VBS if automated, or DATA step with FILE statement to store macro var externally), and then read it in for Project 2. There is no built-in mechanism. And regarding sharing a value from an EG project to LASR -- I don't think so. But there is probably a way to achieve whatever it is you're trying to do. I suggest posting the question to the Visual Analytics board in SAS Support Communities. Thank you for the post! This is exactly what I need. I have another question related to this. I have 5 files that needs to be imported into Oracle. The first file has a header and the 5 files have the same data format. Is it possible to import all the 5 files at once and into the same table? I inadvertently added an extra boundary line, how can I delete it? I've tried simply dragging to another boundary line, but this is duplicating the variable. One way: use the mouse to click on the boundary line (selecting it) then press the Delete key. Also, from the online help: "Use the arrow keys to move the gray break line to the break line that you want to remove and press DELETE. You can also press SPACEBAR to delete a break link. " great tutorial... but how could I import csv files using code instead of using the data import wizard? I use the Import Data task to generate the code for me, and then copy/paste that into a program that I can run repeatedly in production. Works with CSV or fixed-width text files! Is it possible to exchange the input file of the import-task? I want to import several identically structured text files. I thought I could define the import once, copy it and exchange the input file (like in other taks). But I could not find a way doing this. Yes, you can. Right-click on the input file in your process flow (for example, the text or Excel file), then select Properties, then the Change button. You can browse to a new source to change where the flow shortcut is pointing. If I copy the IMPORT-Task, both Import Tasks have the same Input-Table. But I only want to change the input table of the second IMPORT-Task. IS that possible? Try this - add the second file to the project (with File->Open) and DON'T import it. Then right-click->Copy on the Import Data task you want, and right-click->Paste on the second text file. Cool. That worked fine! I did not know this is possible. Eminently useful stuff, as always. QUESTION: Can I get Enterprise Guide to generate the SAS code for me *without* transferring the data across to the server? The reason I ask is that I already have the files on my server but would just like to use Enterprise Guide to generate the DATA step to read the data. The file is large and takes forever (well, it feels like it anyway) to transfer across to where I already have the data. b) Just have Enterprise Guide generate the DATA step *without* transferring anything? Option "b" would be ideal, but "a" would be nearly as good. Jim, I don't think you can limit the rows that EG will download/read, but you can use a DATA step to create a smaller subset of your text file, then use that smaller file as a way to create your template for import. Maybe STOP the DATA step when _N_=20 or so, and that should be enough of a file sample to design your import process. 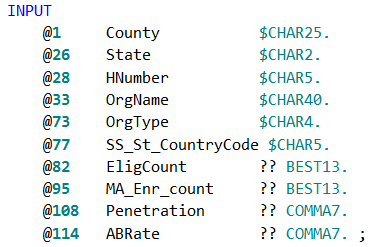 Yes, I thought of just reading in the csv file and writing it back out with a PUT _INFILE_ with an OBS = 500 so as to subset the data. I might be able to do it even faster in UNIX with HEAD -500 my_file.csv > new_file.csv. 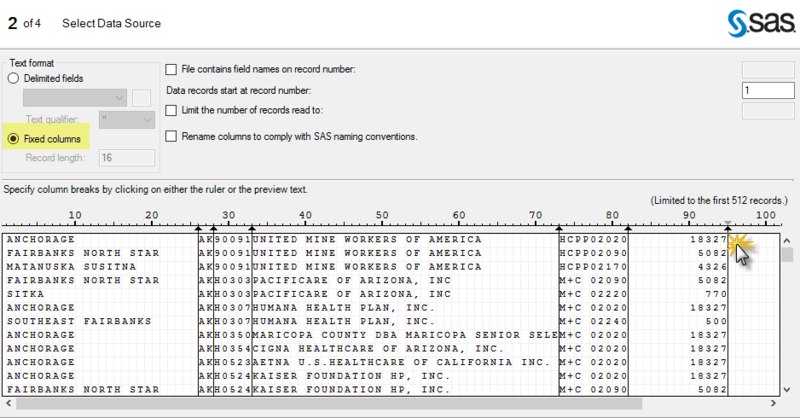 Using either method to subset, I'd then download the subset and generate a detailed DATA step using SAS Enterprise Guide. It's just a bit of fiddling and a number of manual steps.